The human body is designed to move. Todays sedentary lifestyles and cookie-cutter exercise programs make us more prone to pain and injury. The answer lies in going back to how we learned to move in the first place, taking the body back to ground zero and tapping into fundamental human movement patterns. Full-body movements that integrate our muscular subsystems gives us strength, power, flexibility, timing, and coordination. Stability (the ability to control force) rules the movement road. Mobility without the ability to control it becomes a liability. This book helps readers regain stability by using Dr. Perrys unique RAIL Reset system to optimize function of the movement subsystems. Release, Activate, Integrate, Locomotion is the simple system that teaches people how to move better and keep it that way. Strength isnt built; its granted by the nervous system. The brain is always asking itself how safe a movement is and whether giving us more strength is a good idea. Make the brain and body feel safe (read: stable) and it will give us the movements we want. Proximal stability equals optimal distal mobility. 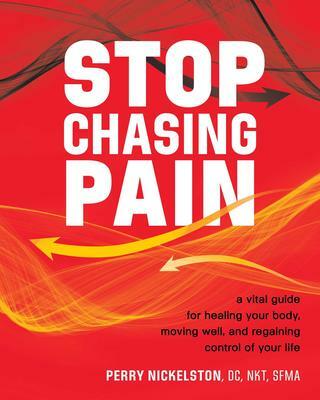 Stop Chasing Pain begins with a fundamental pattern assessment to help readers see where they fall on the movement scale and how much stability they need to regain. Then it explains how to use the RAIL Reset system (Release, Activate, Integrate, Locomotion) to regress movement and progress strength. Mobility restrictions and pain are linked to dysfunction in the five movement subsystems: intrinsics, posterior oblique, anterior oblique, lateral, and deep longitudinal. Without these we dont move. Dr. Perry shows readers how to release them with rollers, balls, and bands; activate them with Chapman Reflex points; integrate with Powerhouse stretching and Primal Movement Chains fundamental patterns; and then stand up and move (locomotion).